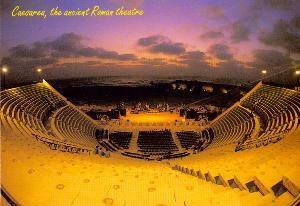 Perhaps the most dramatic biblical event in Caesarea occurred in the very theater where we now sit. Here, one morning in A.D. 44, Herod Agrippa I stood in a silver robe to give an oration, his clothing reflecting the bright Mediterranean sun. “The voice of a god and not of a man!” the people shouted, and Herod approved of their judgment. God didn’t, however, and he struck Herod with worms, with which the king died a horrible death about five days later. We climb the crumbling stone steps of the outdoor theater and choose our seats some 15 feet above the floor. This stadium spans 300 feet across and once held 4,000 spectators. 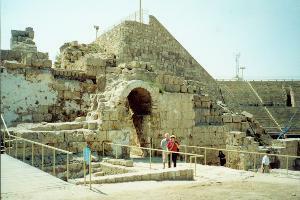 It was erected by Herod the Great as a showpiece in this city which he built about 20 B.C. then named in honor of Caesar Augustus. A few hundred yards in front of us the blue Mediterranean covers the ruins of the ancient world’s first artificial harbor. 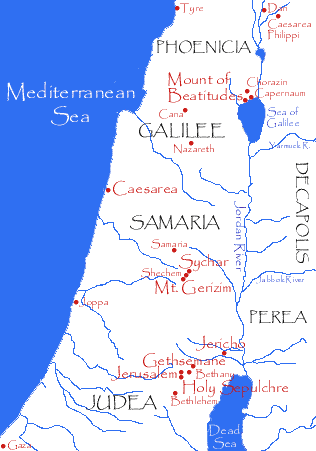 Herod’s ancient harbor boasted two breakwaters extending nearly a quarter-mile into the sea, forming a 60-feet wide entrance for cargo and military ships alike. This construction utilized blocks weighing 50 tons and more, consisting of concrete made from volcanic sand which hardened under water. Also marvelous was Herod’s stone aqueduct, later enlarged by Emperor Hadrian, which brought fresh water to Caesara over a distance of eleven miles. This town, located halfway between Tel Aviv and Haifa on Israel’s western coast, played no direct role in the life of Jesus Christ, but it is an important city in the Book of Acts. 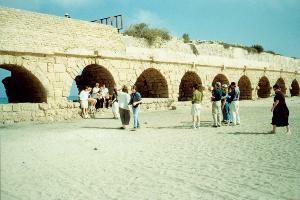 Philip the Evangelist ministered here (Acts 8:40). Peter came here to preach to the Italian centurion Cornelius (Acts 10-11). The Apostle Paul was imprisoned here for a time, stood on trial here before Festus, Felix and Herod Agrippa II, and finally appealed here to Caesar in Rome (Acts 24-26). Looking in front of us now and to the right, we can almost see the ruins of the Roman judgment hall and government complex where those events transpired. 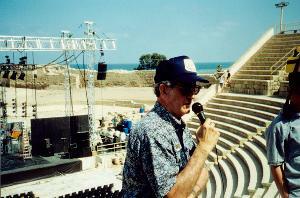 Perhaps the most dramatic biblical event in Caesarea occurred in the very theater where we now sit. Here, one morning in A.D. 44, Herod Agrippa I stood in a silver robe to give an oration, his clothing reflecting the bright Mediterranean sun. “The voice of a god and not of a man!” the people shouted, and Herod approved of their judgment. God didn’t, however, and he struck Herod with worms, with which the king died a horrible death about five days later (Acts 12:21-23). Luke begins and ends Acts chapter 12 with a pair of Greek words which, used together, mean “on the one hand and on the other.” Thus Acts 12 opens, on the one hand, with Peter in prison under round-the-clock guard, and with the church, on the other hand, praying fervently for his deliverance (Acts 12:4-5). The two sides face off, as it were, and the battle ensues. The chapter closes with Herod, on the one hand, eaten by worms and dead, but with the word of God, on the other hand, going forward and increasing (Acts 12:23-24).